Weddings are stressful, no bones about it. Leading up to the wedding, you can go through a range of emotions that you didn't even know existed! You may be dealing with budget issues, guest list anxieties, trouble securing suitable vendors, DIY projects up to your eyeballs - all on top of your regular life which can cause stress. Your stress can lead to unwelcome visitors like neck and back pain, anxiety, fatigue, raised blood pressure and a number of other symptoms that don't lend themselves well to your wedding-glow. Since I am going to the spa today with my sister to get a massage, it started me thinking about brides [and grooms! and bridal parties!] getting a stress-relieving massage on their wedding day or the day before. I have been working on a number of different events lately that have me working at all hours of the day and a massage is definitely what I need to help melt away some of my tensions. I am getting headaches more frequently and I know that even just a few minutes on the table make me feel infinitely more relaxed... I am looking forward to it, needless to say! The same can work for brides on their wedding day. It doesn't have to be a full body 90 minute rub-down, even just an upper back neck and shoulders massage for 15-30 minutes can ease the stress and prepare you mentally for your big day. It can be a wonderful group activity for the key members of the wedding party so that everyone has a clearer head and is a little more zen. You deserve to be pampered on your wedding day, so why not look into bringing a masseuse or massage team in for a treat? Many spas offer bridal and group packages, so be sure to inquire about the different rates available. Bridal Yoga might also be a cool way for you to bliss out and connect with yourself just before your wedding. Inquire at your local yoga studio to see if you can arrange a private gentle yoga class the week of or day of your wedding for you and your wedding party. 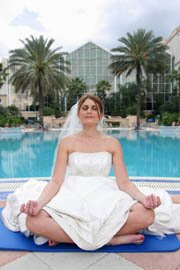 Are you planning any relaxation treatments on or just before your wedding day?